It’s every kid’s dream to feel out of the ordinary on Halloween. This makes most parents to choose unique costumes to gift their kids during this festivity. The costumes below are going to give you the best ideas for the perfect costume to choose for your son during this event. One that is affordable, one that suits your son’s specifications, one that will be comfortable for him as he walks around during the event and most importantly one that will make him feel special among his friends. The costume is a red and blue jumpsuit made with Lycra spandex material which stretches easily making it easy to put on and remove. The jumpsuit is one piece with socks and gloves. It comes in four sizes that are, Kid Small, Kid Medium, Kid Large and Kid Extra Large. The bodysuit is fully accessorized with Cosplay weapons including a sword. It also comes with a belt and a detached mask. This costume outnumbers others because of its great comforts since its breathable and has outstanding elasticity. It has a hidden zipper at the back making it a great design for your son. It’s suitable for a superhero theme. This is a body suit made of 100% polyester fabric. It has vibrant color. Presence of simulated muscles and shoulders gives it the full iron-man look. The costume is available in size medium which fits most children 50-54 inch tall, 27-30 inch waist and 29-32 inch hips. It comes with a mask and 3D boot tops giving it a more reasonable look. It’s suitable for Avengers to pretend play where your son can come together with friends and form a group of Avengers. For any kid who is so into trains, this costume would be the best gift. It comes as a blue and white overall made of 60% cotton and 40% polyester. This is accompanied by a red neckerchief and a cap matching the overall. It comes in three sizes; small (24mos-2T), large(3T-4T), X-large(4-6). The costume fits perfectly and it’s comfortable enough to enable your son to play and trick and treat in it. The neckerchief is big enough so it can be tied loosely enhancing comforts and safety. It’s important to note that this costume should be hand washed separately in cold water and if necessary use non-chlorine bleach. Line dry and cool iron if need be. Rubies has provided the formally approved Godzilla costume which is guaranteed to be genuine. This costume is a full bodysuit with a zip at the back and a fixed tail. It’s made of polyester material. It is in a dark color and comes in one size which fits up to 70 pounds. The costume requires a fan which uses 4 AA batteries. It’s lightness increases comforts and makes it possible for the kid to wear it for longer. This is the approved Hasbro licensed costume which comes as a jumpsuit with enhanced muscle arms and chest. It’s accompanied by a mask both of which are made with quality materials normally used to make Disguise products. This costume creates fun for your son by putting him in a world of pretend play. Disguise caters for everything, whether it’s Halloween, themed birthday parties or even a night full of fun. Rubies showcase a cute tunic that comes with a shirt, pants that come with a pair of boot tops and a belt. Your son won’t be disappointed by this great costume designed to please any Star wars fan. Customers should note that, costumes are not made the same size as clothing therefore they should consult Rubies’ child size chart, do not buy any costume based on age or normal clothing size. Allow your son to be his favorite character as Captain Rex this Halloween. This is a jumpsuit that is light and made with polyester fabric. It comes with a synthetic half mask, an elastic helmet and a Velcro closure. The costume is sized medium and has a vibrant color that your son will obviously love. The blaster is sold independently. Since costumes are sized differently from clothes, it’s important for costumers to check Rubies child size chart to buy the right costume size. For this costume, if your child has lengthened chest, we suggest moving up a size. The costume comes as a tunic with attached chest belt, belt with an attached small bag, a pair of boot covers and a hat. It’s a one color costume. The materials used to make the costume are: tunic;100% polyester, belt and straps;100% leather, foam;100% polyurethane, hat;100% polyester, boot covers; leather and foam. Note that the toy sword, toy shield and pants are not included. This costume is perfect for any kid who is a fan of Legend of Zelda. Rubies provide this Guardians of the Galaxy costume which is a full bodysuit with shoe covers and a mask attached. This is a medium sized costume recommended for kids 5 to 7 years old. Customers should note that these costumes are sized differently from clothing therefore they should consult Rubie’s child chart before making a selection. Any kid obsessed with battling the bad guys will definitely like this one. It’s a one piece jumpsuit size 4-6, with a permanently attached tail and Velcro closure. The fabric is 100% polyester and it even gets better with the separate character mask, matching shoe covers and matching character wings giving it the full dragon look. Shoes are not included in the package. This would be suitable for imaginative playtime fun. This is a one color jumpsuit with bright graphics making it attractive and has enhanced muscle arms and torso. It comes with a character mask completing this amazing costume. It’s the best costume for any kid obsessed with transformers. This costume is inspiring from every aspect to any kid who wants to play a hero. It displays a muscle chest jumpsuit with attached boot tops, headpiece, cape and belt. It comes in size medium which fits most 5-7 year olds, 50” to 54” tall. The material used to make the costume is 100% polyester making it warm thus suitable for cold evenings as your kid goes trick and treating. This costume is a 100% polyester jumpsuit complete with molded chest, elbow and knee pads, belt and a mask. It’s one color and size small. The product is imported and it’s advisable to stuff the shell with paper to make it filled out. This would be suitable for any boy obsessed with heroes in a half shell portraying that turtle power. This is the officially licensed deluxe ankle length Harry Potter hooded robe. The black fleece costume robe has burgundy accents and an embroidered patch with Gryffindor house emblem. The robe measures approximately small 35 inches, medium 39 inches and large 44 inches from neck to hem. Its 100% polyester however all accessories are available separately. This costume is preferred for Halloween, book reports or just for fun. Rubies showcase this great design displaying a jumpsuit with built in boot covers, printed cloth belt, cap and molded synthetic mask. The costume is medium sized and made of polyester material. The gloves and light saber are not included. This is the formally approved star wars costume, a brand name of Disney and Lucas films, look for authentic brand name on packaging and labels. With this Darth Vader costume your son can be the chosen one who gets changed by the dark side. The perfect costume for a kid who loves having fun playing the hero would be this one. It’s a jumpsuit with a well built muscle chest. The criminals of Gotham city will have to escape when they see you and your muscle chest in this exclusive Batman costume. It’s 100% polyester providing the warmth required for fun at any time. It’s sized small and the color of the costume is blue. The costume is accompanied by a cape, headpiece and a belt. The shoes and gloves are sold separately. This costume would be perfect for any kid who loves being the movie character. It comes as a purple jacket, a green vest with an attached tie making it stylish. Pants and a joker mask are also included in the package making it advantageous in that there won’t be going back in the market to fit the pieces together. California costumes showcase this cute designed costume in a warrior jumpsuit. It has an attached hood thus your kid won’t lose it. It also includes red ties, red belt with foam stars and a mask giving your boy that fierce ninja look. You would also love the fact that its 100% polyester providing warmth and comforts that your son needs when he wears it. The costume comes in sizes S(6-8), M(8-10), L(10-12), LP(10-12),XXL(14-16),Medium plus and X-large. Comes as a medium sized, multicolored jumpsuit with “S” logo on the chest. It’s a 100% polyester costume made in the U.S. It’s accompanied by a cape with Velcro closure and belt ties at the rear. This costume will bring out the superhero fantasy in your son. Superheroes never go out of style. This features a jumpsuit with blue overalls, big yellow buttons and an attached red long sleeve shirt. It’s fully accessorized with a hat and mustache which completes the look. Comes in size medium which fits child size 8 to 10. The costume should be hand washed in cold water and dried flat. This is the officially approved Super Mario Brothers costume. It’s the formally approved Star Wars Episode VII the Force Awakens deluxe Storm trooper costume. Deluxe kids Star Wars Storm trooper costume is a fully padded bodysuit that is based on the new storm trooper outfits that are worn in Star Wars The Force Awakens and comes with a half mask(covers the face and front half of the head), belt and boot tops. The suit features Hi-definition photo-real printing. It comes in size small which fits kids 39 to 45 inches tall and weighing 38 to 42 pounds. The costume is made of 100% polyester material. This would be the perfect costume for any Star Wars fan on Halloween and for whole year pretend play fun. Any Flash inspired kid would love this costume for Halloween. Its 100% polyester costume with simulated muscle torso technology. The costume comes with attached boot tops, belt ties and a mask that completely covers the head bringing out the full flash look. Do not buy this costume according to age because costumes re seized differently from clothing. You should consult Rubie’s child size chart before selecting size; this Deluxe Muscle Chest The Flash costume does run large. Your son can satisfy his superhero fantasies with this costume at hand by having fun role-playing one of the best members of the Justice League. With this costume, your kid can symbolize speed and savior in one just like the flash. This is a police role play costume which includes: navy blue jacket, shirt, pants, hat, belt, whistle and gun holster and walkie-talkie bringing out the real policeman character. The very realistic looking jacket shows an embroidered police patch and ‘ police’ print over the chest, printed letters ‘police’ on the backside, embroidered police patch on both shoulders, real shirt pocket and buttons. Shoes are not included in the bundle. The costume is 100% polyester with the following unique characteristics: wrinkle resistant, resistant to most chemicals, resistant to shrinking and stretching and resistant to mildew and abrasion. 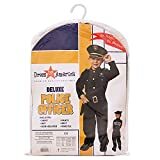 This costume will be a perfect for any kid who likes pretend playing as a cop or one who dreams of securing and serving sometime in the police world. Any PJ Masks fan would be thrilled by this Gekko costume. It is made with polyester material giving the warmth required for a cold evening or night trick or treating. The costume comes as a jumpsuit with a removable tail and a soft headpiece that will provide maximum comfort for your son. The costume is size large which is recommended for kids aged between 4 to 6 years. . This is the formally licensed product and it’s imported. PJ Masks follow an exciting night adventure among three young friends who change into their dynamic super hero alter egos, Cat boy, Owlette and Gekko. Gekko is the youngest of the group but has super Gekko powers these include: camouflage to change colors and blend in with his surroundings, Super Gekko Muscles to haul up heavy things, Super lizard grip to climb walls or secure himself to stop vehicles and super lizard water run to walk on water. With this outstanding costume, your son can picture himself as their favorite superhero Gekko . This T-Rex costume is made with polyester fabric making it a good choice since it will provide the warmth needed for your son as he goes for trick and treat on Halloween. The material is also suitable for comforts as your kid plays and runs around. It comes as a standard child size fitting up to approximately 54” in height, the measurements vary with the amount of inflation in that when inflated the Jurassic World T-Rex is approximately 58” tall and 18” wide, the tail is 34” long and head is 18*10”. It is made in such a way that it covers the head, your kid’s head should not fit through the face opening. The inflatable fan used needs least assembly and instructions should be keenly followed while assembling. The fan uses 4 AA batteries which are bought separately. It is worth noting that you should not use rechargeable nickel-cadmium batteries. When the costume is not in use, remove batteries from fan. Buying this costume for your son who is thrilled by events of the Jurassic world will be breathtaking and make him have the most fun Halloween. The costume comes as a jumpsuit with a removable tail and soft headpiece. The softness further ensures your kid feels comfortable when wearing it. It’s made with polyester fabric therefore it’s suitable to be worn in cold evenings or nights. The costume is recommended for kids aged between 4-6 years. This is the formally licensed product and it’s imported. It would be the best costume to give a huge PJ Masks fan. PJ Masks unfolds an adventurous night of three young friends who convert into their dynamic super hero forms, Cat boy, Owlette and Gekko. Cat boy is the leader of the group and has super-hearing using his cat ears, his super cat jump makes him leap high and far and his super cat speed makes him sprint fast. Gifting your son with this costume will be exciting since he will be able to dress as his favorite superhero Cat boy. This is a one of a kind costume, very popular though it’s creepy. It is a full bodysuit made with spandex material, covering the whole body from head to toes. It’s uniqueness is that when you are wearing it, no one can see you but you can see, breathe and even drink through them. This kids Morphsuit is considerably safe and has special features that make it the best for children. For instance, to remove the costume easily at the rear part of the head, it has 1 zip rather than 2 zips and a hood with quick release Velcro is fixed and if you want to show your face just tear the Velcro on the hood and tuck it in. It has superb visibility since the fabric on the face has minimum density. It fits size based on height medium 3’6-3’11/8-10 Years (105cm-119cm). Zalgo Morphsuits are suitable for kids who like giving the biggest scares due to the high quality printing and 3D fingers. The costume is imported and should be washed in cold water. 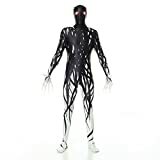 Morph suits come in 100 different colors and patterns from black to blue, tuxedo to tie-dye, superheroes to scary therefore giving you a variety to choose from. This makes it ideal not only for Halloween but for themed parties, charity events, school spirit, sport events and running around the house as well.